NO Surprises ◊ Extremely AFFORDABLE ◊ 10-Year Warranty! We get Acworth Bats OUT & KEEP them OUT! Bats are protected in the United States. Harming a bat can result in a serious fine! If you want to have a better understanding of why bats are protected you can read about it here. 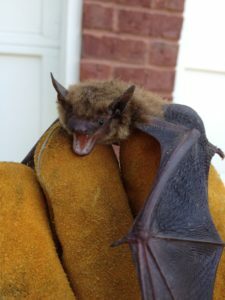 We have fully trained, licensed & insured Acworth Bat Removal Specialists who can quickly & inexpensively get the bats out of your home and prevent them from returning while utilizing techniques which ensure no bats are ever harmed in the process. The bat inspection is a pretty straight-forward process. We have to determine where the bats are getting in and what it will take to get them out, keep them out & clean up any guano (if necessary). We block off enough time on our schedule to do the work. We give you the price to take care of the problem and if you say “Go ahead” we immediately do the work and we waive the inspection fee. Simple terms – if the bats are sitting in the gable vent without having access in the attic we can hand remove them. If they have access inside we have to use one-way valves and a return trip is necessary to complete the job. Bats are FEDERALLY protected and during the Maternity Season of April 1st – July 31st extra precautions need to be taken by Licensed Professionals. Call us and we can explain the process to you. Don’t let other companies scare you into paying crazy amounts of money thinking your life is in danger. We can give you a peace of mind and help you quickly. We answer our phones 24/7! We only use the highest quality materials and devices, therefore, we are proudly able to offer a 10 YEAR WARRANTY. Just FYI, Our Warranty does not have an annual fee. With Acworth Bat problems, we have found that bats are amazingly able to squeeze through narrow slits and cracks. For purposes of bat control, one should pay attention to any gap of approximately 1/4 x 1 1/2 inches (0.6 x 3.8 cm) or a hole 5/8 x 7/8 inch (1.6 x 2.2 cm). Such openings must be considered potential entries for at least the smaller species, such as the little brown bat. The smaller species require an opening no wider than 3/8 inch (0.95 cm), that is, a hole the diameter of a dime. Openings of these dimensions are not uncommon in older wood frame structures where boards have shrunk, warped, or otherwise become loosened. These facts are what our Licensed bat Specialist are trained to recognize and immediately identify in order to get the bats out of your attic or gable vents and keep them out. In Acworth Bat Removal the process is actually laid out pretty simple. If you know what you are doing and take the time to do it right, it is easy to get the bats out of the attic. We service the entire Acworth Georgia area for bat trapping, bat removal, bat control & bat exclusion. If the Bat Technician cannot see that all of the bats have vacated the building then a one-way valve needs to be installed to allow all of the bats to leave and it will deny the bats from reentering your home. Then our Bat Removal team will return and remove the bat’s one-way valve and seal up the final exit. You will then be BAT FREE! HOWEVER – With all of this said, there are extra measures and precautions that need to be taking during the “baby season” to ensure that no bats are harmed in the process and we have to check for flightless babies.